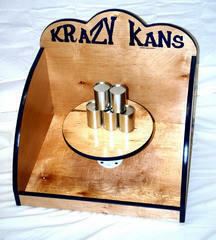 Krazy Kans is a classic carnival game that comes with a bean bag and old world milk cans to knock off the pedestal. This is a classic game great for outdoors (noisy indoors) that requires a table and canopy tent. Not the best option for an indoor event. Consider Tip A Troll for indoors.